Just to emphasise the change in platoon structure, I thought I'd post the updated platoon organisation. Command Section: 1xCommander, 1xComms and 2xLight Infantry - Slingshot IFV. Support Section: 1xLeader, 1xRocket Launcher, 2xLMG - Slingshot IFV. 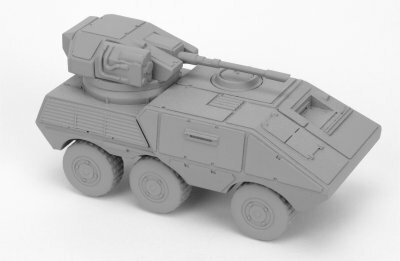 Section1: 2 Fireteams with: 1xLeader, 1xRocket Launcher, 1xLight Infantry, 1xLMG - Glaive APC. Section2: 2 Fireteams with: 1xLeader, 1xRocket Launcher, 1xLight Infantry, 1xLMG - Glaive APC. Section3: 2 Fireteams with: 1xLeader, 1xRocket Launcher, 1xLight Infantry, 1xLMG - Glaive APC. As you can see, it consisted of 32 troops and 5 vehicles. With each of the basic fire-teams having a LMG and a rocket launcher (single-shot for anti-tank actions), I thought that having a support squad was taking things a little far, especially with all of the vehicles having a heavy weapon (the Slingshot has a cannon and the Glaive has a mini-gun turret) so I decided to drop it with the added bonus that it lines things up more closely with the British organisation I am basing things on (loosely...but not TOO loosely). Without a support squad and its associated vehicle, we have 28 troops and 4 vehicles. That makes things easier for the platoon commander to handle and means that the vehicles will be an easier fit for a platoon specific drop-ship. It also ties things in nicely with the British Army because a platoon commander is supposed to be in charge of up to 30 troops. My basic idea for an infantry company is a block of 3 platoons under the overall command of a Company command section of 4 personnel, with one of them being a fairly senior officer (more about the rank structure later). As for the painted support section...it has now been divided between an infantry section and lessens the painting load for a complete platoon so nothing has been wasted. I have also decided to have a slight variation in colours for the first platoon in order to tie the test troopers in properly. My current thinking is all about how the support units will be made up. I already have some heavy infantry, snipers and heavy weapons with the intention of adding some medical, comms and engineering/sapper units at a later date so I am investigating how these fit into the British Army to get an idea of how I will fit them into my army. It is still alot of guys. But it looks better I must admit.